In early 2017, Facebook added a feature that uses speech to text software to add captions automatically to all videos in English. However, these auto-generated captions are often inaccurate, and if your video isn’t in English, or only for English-speaking audiences, you can’t rely on it all. Download our comprehensive guide to captions on Facebook, YouTube, Vimeo, Netflix, Amazon Video Direct, and iTunes. For these reasons and others, many vloggers and other video content producers opt to add their own captions to Facebook videos. But that caption integration requires some nuances. Facebook puts the burden of identifying the language in the captions on their users, as well as adding the country code for the language’s nation of origin. Even if you only have one captions file and Facebook knows your preferred language, the site doesn’t automatically make the connection. Facebook requires you to put a language suffix on all your caption files, even if your language is English. Someone in the US uploading a captions file in Spanish to a Facebook video needs to title their file something like “captions.es_LA.srt”. This is because even though the speaker is in the US, and so are their viewers, the Spanish language didn’t originate here, so “LA” is the generic country code for Spanish. When you have to upload captions to multiple versions of a video, or just simply aren’t paying attention, this small element can become a bit of a hassle. That’s why we offer the option of delivering your captions files with this save name already applied at no extra charge. Of course, since other sites don’t have the same rules, you’ll be able to use the file on all your channels at once, without having to remember to rename it. Step 1: Have both the video file and the captions file ready. Make sure the captions file is in .SRT format. 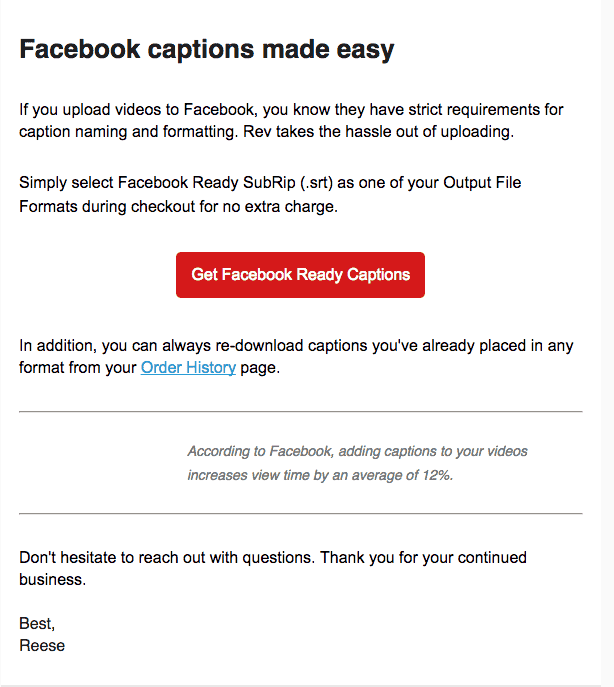 If you’ve ordered captions from Rev before in a different format, we will convert the file at no cost. Step 2: Post your video without captions. Step 4: Confirm that your captions file meets Facebook’s captions file naming convention: filename. [language code]_[country code].srt. If you got it from Rev, you don’t have to worry! Just upload. Step 5: Toggle the captions on and off, and review for quality. Technology is always evolving, and maybe soon adding closed captions to Facebook videos won’t be a task. Until then, we’ve got your back.